It’s hard for my camera to pick up red shades and I’ve tried to manipulate the photo to get the shade as close to real life as I can. This is the best I can get. 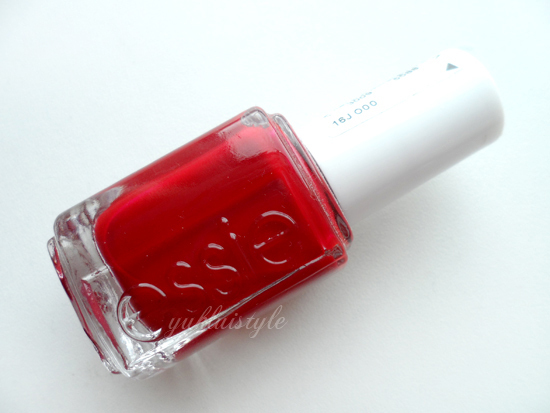 In real life, it is how Essie describes it “spicy, dark, creamy red”. It is a lovely deep, berry, blood red, similar to the Rimmel Kate 107 lipstick with a tad blue, neutral undertone so it is purely red without any orange or pinks. Best description I could give. This is like a glamorous red, not bright, not too dark without looking tacky and cheap as many red do. Looks classy like the 1940s and feels feminine. This will suit all skin tones. Totally recommend this shade if you’re look for a deep red ready for autumn or now! Have you used Essie nail polishes before? As if you've never bought an Essie nail polish before! This is gorgeous. I love red nail polish. this colour will be perfect for crimbo time! I have never tried Essie before but I here they are great and this colour is stunning! Very nice color, this is very shiny..